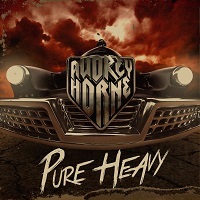 I think that Audrey Horne is one of the coolest band names ever. For all of us who grew up on Twin Peaks, the name sure rings a bell and for you never saw it, Audrey Horne is one of the leading characters in that TV series, played by actress Sherilynn Fenn. So when I first heard about the band, I really wanted to like them. But it took me all up to 2012 and their last album Youngblood to do that, an album I found to be really damn great. But their career started sooner than that, back in 2002 to be more precise. The band consists of a bunch of guys with their roots in the Norwegian black metal scene that wanted to broaden their horizons a bit and go for the throat with more traditional hard rock and metal. Their first albums No Hay Banda (2005) and Le Fol (2007) were more inspired and influenced by the more depressive and darker grunge movement than anything else. But with their self titled third album that came out in 2010, more hard rock and sleazier influences had snuck themselves into the music which finally took over with their last album, a move I embraced. However, it should be noted that I haven’t actually heard their first three albums at all, so what I wrote here are just second-hand information, stuff I have read and heard people say. Why haven’t I listened to them then? Well, grunge never was my scene and just couldn’t be arsed to. Maybe this is not good research, but then so be it. Maybe if I find the time and interest, I’ll give them a shot one day if someone can convince me to. But after their last great album, I sure wasn’t gonna miss out on listening to this album. Besides, with a really cool band name and a title like Pure Heavy, every rocker should at least give it a shot. With the high quality of their previous record, expectations on this record has grown high and hopefully the boys will rise to the occasion and even better that one. “Wolf In My Heart” kicks the album into motion and the song is totally 80’s melodic hard rock. The song’s very catchy guitar melody even reminds me of Night Ranger. This is not cheesy at all, this rocks and the song is a killer. “Holy Roller” goes in a more classic heavy metal from the 80’s and the riffs makes me think of bands such as Saxon and Accept – this is really good. “Out Of The City” rolls with the best of 70’s melodic rockers and contains some fine twin lead guitar work a’la Thin Lizzy. “Tales From The Crypt” has some really hot drum rhythm grooves while the song itself borrows heavily from 70’s hard rock music. They make their own version of the Black Sabbath “Sweet Leaf”-coughing, they borrow the guitar intro from Kiss’ “King Of The Night Time World” and there also are some cool guitar solo spots stolen / borrowed right from said bands’ “100 000 Years” and “Love Gun” – very cool. Also there’s some tribute paying lyrics like “Gonna paint it up, in bright colors, like David Lee in ’83 / like mr Sixx in ’86”. Some people never stop being fans and I love that! “Gravity” is an awesome rocker that stands steady in 70’s hard rock with a nice little twist of the 80’s. Some nice Iron Maiden influences shines through on the retro 80’s classic metal hardrocker “High And Dry” – great stuff. “Waiting For The Night” is a bloody brilliant melodic hard rocker, catchy but no cheese. Iron Maiden comes back in “Boy Wonder”, mixed with some Blue Öyster Cult melodies and I think of Swedish satanic rockers Ghost at times musically. That song is the album’s closing track and all should be hunky dory with that. But wait, there are some bonus tracks that we must give a spin. “Let Live” almost pisses me off and I’m thinking: What are they thinking? “Let Live” is a damn killer, one of the best songs here. It’s a catchy, but raw hard rocker and waaaaaay too good to be thrown in as a bonus track. The other bonus track is called “Between The Devil And The Deep Blue Sea” and that one’s place as a bonus track is more understandable. It’s not bad, but quite unforgettable. The song is a Thin Lizzy / Iron Maiden pastiche, but a song I can live without. What I love the most about Audrey Horne and this album – apart from all the great songs, that is – is that they’re not afraid to be unoriginal. They don’t care! That said, they have a sound of their own and a clear identity, but they show their influences on their sleeves – and then some. It’s totally clear that the guys loves what they do and that the music they play dwells in their hearts and souls – and they show it!. It also helps that they really know how to work their instruments, it’s easy to hear that they have been around the block musically. It also shines through how unpretentious they are. I mean, they are all from the black metal scene – bands such as Sahg, Enslaved and Gorgoroth, to name a few – and normally, this kind of music doesn’t stand tall in the community of black metal and death metal, so I guess it takes some guts as well. So, I dare all rockers out there to at least give this a shot because, well, this rocks – and it rocks hard with a groove and a magnificent sense of melody. And no, you don’t have to be a Twin Peaks fan to dig this. A rock-fan is enough!